Marjoram is often overlooked in place of oregano, the latter being easier to find in its dried form, but common dried oregano is dreadful. Marjoram has much more to offer – it’s more heavily scented, with musky, spicy notes and a sweet, warming herbal taste. It goes well with meats, but vegetable dishes also benefit from its spicy warmth. It’s good chopped and added to minced meat mixtures like meatballs, hamburgers and stuffings, and in meat sauces. It’s also excellent in marinades for roasted or barbecued meat, in pasta stuffings and sauces, with green beans and dried white beans, with tomatoes, cabbage, red peppers, eggplants and much more. It’s easy to grow in a pot in light soil in a sunny spot, and cuttings are easily taken by removing a ‘heel’ from the plant in late summer. The unopened flower heads look like miniature green pinecones. The plant – leaves and flowers – can be used at any stage. If the plant gets leggy, give it a good haircut and it will come back, in force. In temperate climates it will last throughout the year. Although marjoram is more commonly used as a fresh herb, it can be dried: pick long stems on a dry day and dry at room temperature on a rack, then pack in a container, still on the stem. Rub between the palms of the hands to release the essential oils before using. 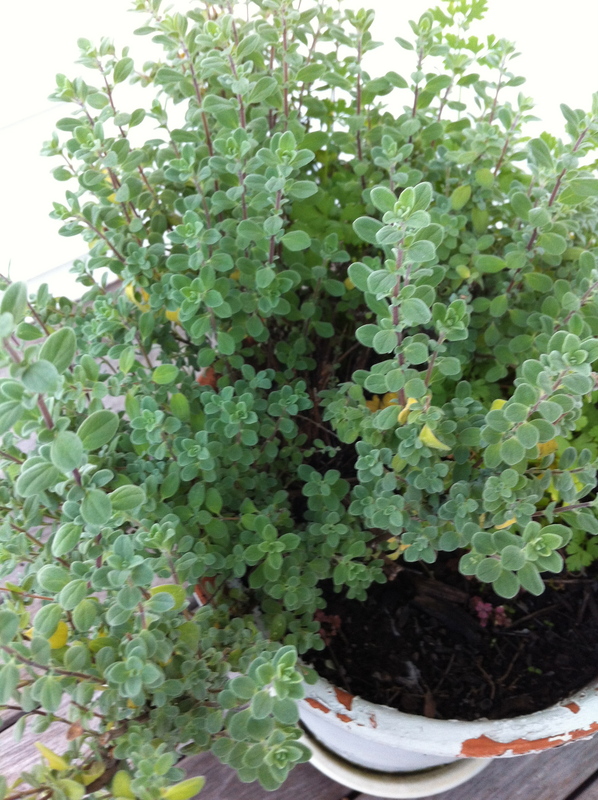 Marjoram’s one of my favourite herbs, and it makes me smile when I sniff it. Fresh bay, strongly aromatic, like pine needles, eucalypt and lemon all crushed together, with a scattering of floral blossoms on top. Meatballs – Never been easier, never been better! Little round things it seems appeal to the eye and are good in the mouth, morsels of food you can shove in without having to worry too much about chewing and swallowing. Little nuggets of flavour. Mmmm, they’re pretty damned good. Oregano – Joy of the mountain! Though it seems just like yesterday, it was in fact 40 years ago that I spent a week walking the hills of Crete. A striking memory is the aromatic scents that rose all around us as we crushed wild thyme and oregano underfoot. The oregano was ‘rigani’, origanum vulgare (hirtum). Bit of a gob-full, I suppose, but the last name (hirtum) is pretty important.